Busy Bee Meets Boss Babes Part 7. Sydney Lester — The Busy Bee Productivity Coaching, LLC. I'm SO excited to feature another guest on the Busy Bee Meets Boss Babes Blog Series. I started this blog in June and have connected with so many AMAZING women and this guest is no exception. Meet Sydney Lester, personal stylist and owner of Chic Stripes! This girl has over 10K followers on instagram and a growing business here in RVA. You will love getting a behind the scenes look at her life, business and her routines to stay successful. On the blog today, you'll learn some productivity tips and get inspired by Sydney and the amazing work that she does. Sydney and I connected through a local networking group, Boss Babes RVA! When we were emailing back and forth, we realized we live in the same neighborhood! Small world! I'm so excited to connect with her and continue to promote the amazing things female entrepreneurs are doing in RVA. Let's get started! Meet Sydney! 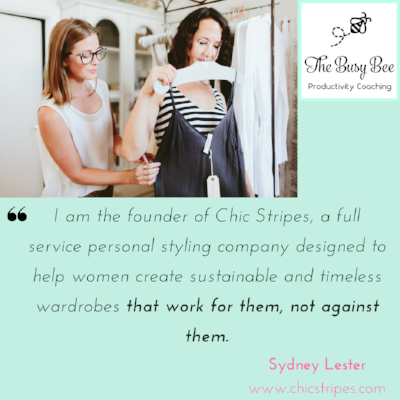 My name is Sydney and I am the founder of Chic Stripes, a full service personal styling company designed to help women create sustainable and timeless wardrobes that work for them, not against them. Tell us all about Chic Stripes! How did you get started and get the courage to step outside your comfort zone? My business really grew out of the Chic Stripes style blog I started way back in 2009 before blogging was a thing. The blog went through several iterations (finding my voice if you will) until I settled on blogging about second hand style - I always loved thrifting and shopping second hand and sharing my love of that through my personal style was the perfect fit. Through blogging, I learned about and attended the School of Style (a boutique styling agency in LA / NYC) and that really sparked my interest in turning this fashion thing into a business (and gave me confidence that it could indeed be a business). Over the years, I slowly went from having the blog be a hobby (2009-2014), to a side business (2014-2016), to a true part-time business when my day job eliminated my full-time position (April 2016) (throughout this whole time, I was working full-time in the social work/ mental health field, putting my graduate degree to use as a grant writer / community engagement facilitator), to now (seriously this very moment in August 2017) when I am finally ready and able to take Chic Stripes full time. Tell us more about your life outside of Chic Stripes! What are some of your personal responsibilities? Tell us about your daily routines to stay on track throughout the day! Three things: my community, podcasts, and books. The community around supporting business owners, especially women business owners in RIchmond is amazing. I am a part of the Boss Babes RVA Facebook group and it’s such a valuable resource because you can get advice, find people who have skill sets you need, and just receive support in so many aspects of your business. I find that in order to stay in the flow, I need to constantly surround myself with encouraging, supportive, and uplifting things. I listen to business / creativity podcasts while driving (it helps that my radio is broken) and am constantly reading the Big Business Book Classics (7 Habits of Highly Effective People is one I am going through now). I just love being in a constant state of learning and expanding and seeing how other people have done things - learning from the business greats is so accessible through books, podcasts, and even social media now. There are definitely downs as an entrepreneur. A client project gets cut short, a prospect doesn’t sign with you, a new program doesn’t work out, someone is rude or doesn’t respect you. I usually give myself a short (really short) timeframe to whine, cry, vent, or do whatever I need to do to get my feelings out and then put it from my mind and remind myself of all the satisfied clients, programs that are great, and people who are nice. I live by Evernote for my detailed weekly to-do lists, notes and ideas, and my iphone calendar. For productivity, I combine a pomodoro timer and the Coffitivity app for being super focused and knocking things out and always put on headphones as my signal to get down to work. Within my business, I have tried to automate a lot - I use systems like Acuity Scheduling so that clients can schedule AND pay for their services all in one place. This cuts down the back and forth of emailing about what days/times work for everyone. I use MailChimp automations (free) for welcoming newsletter subscribers and for my Personal Style Services clients. I use MoonClerk to take payments for my subscription and recurring services since it lets me autocharge credit cards. Recently I started using HubSpot (free!) to track my client prospects - it’s really helpful to put all of those prospects in there because then I can track where they are in the process (initial inquiry, did they schedule a call, did I send them the contract, etc.). I started out this year saying NO to things and then realized how important it was to say YES to all the things - but, making sure it was all the right things. I go to networking events, blog events, and whatever else - but I am pretty choosy with what and when I go to them. If my husband is already engaged with something, then I may choose to throw in an extra networking event. We have scheduled date nights on Mondays and try to plan weekend trips to go camping. But I also try to cut out things - when my schedule is feeling hectic and I’m stressed, I block out my calendar and don’t schedule anything so that I can actually get work done. I basically just schedule everything in my calendar - from times I want to work out, to my morning routine, to date nights, to going grocery shopping to work projects. This level of scheduling allows me to stay organized and accomplish a lot in a focused amount of time. In terms of “doing it all” - I like to think I work smarter and not harder. I’m selective on what I choose to do and who I choose to align myself with. Being smart about your networking and the projects you take on can actually get you more projects/jobs. This idea cropped up in a book I am reading (Good to Great), and it is the idea that to be a great company, you need to crawl, walk and then run. Companies that start out running, eventually walk, then crawl, and then wither away. Starting small and growing slowly is fine. It gives you time to perfect things, test things, and then go. On the flip side though, I will say - just do the things! If you get an idea, do it. If someone asks you to do something, say yes. You never know where those opportunities will lead. Trust the universe. WOW! SO many great takeaways. Sydney, you are an inspiration and I have learned so much from you. Thank you for pouring into us and sharing your wisdom. I really enjoyed your morning routine, and also hearing about your ups and downs as an entrepreneur. I think it's super powerful how you overcome those low moments that we ALL feel- but not many of us share! It's important to remember we are not alone. Thanks again, Sydney, and I look forward to getting to know you better! On social media everywhere @chicstripes! Newer PostONE HOUR, $50.00, 6 Frozen Crockpot meals from Aldi!